With this post, my Soldiers of the 38th blog has been running for more than six years. This is not the end, but perhaps the end of the beginning. 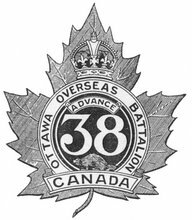 At this point, I've entered the basics for 4,268 identified officers, NCOs, and men who served, however briefly or however long, with the 38th Battalion, Canadian Expeditionary Force, during the First World War. Some entries are truly rudimentary, others have been fleshed out with information from additional sources, including numerous family members and others who have graciously provided additional textual and photographic information. The next step is to continue expanding these existing entries - and add any others that might yet be discovered - in the hopes of building on what exists here as a true tribute to their service to King and country. So, although, there may not be any - or at least many - additional, new posts added to this blog I will update (and re-date) those entries I amend, showing what's been added in each case. Just think what another six years might accomplish.